Last year I announced the creation of a Retro Gaming Project in which I would finally go back and play through all of the classic NES and SNES games I missed over the years. This is a long work in progress with no set end date. Super C, the 1990 sequel to Contra, may very well be my favorite video game of all time. I know a great deal of my love for the game is owed to nostalgia — it was one of the first I ever played — but I still love dusting off the old cartridge and playing it today. Amazingly, even after all these years, I had never played the original game in the series. In an effort to go back and kick-start this Retro Gaming Project, Contra seemed as good of a choice as any to get back into it. I felt right at home instantly. The run-and-gun, shoot ’em up gameplay fits in perfectly with the excess of 80s action movies, and the two dudes on the box art are even dead ringers for Rambo and Dutch from Predator. The plot is standard sci-fi/action fare — aliens have invaded Earth, and only Bill “Mad Dog” Rizer and Lance “Scorpion” Bean are bad enough to destroy them. The gameplay basically consists of shooting everything that moves while dodging enemies and stray bullets. In fact, it’s most beneficial to keep a finger on the shooting button the entire time — you never know when an enemy will pop up out of nowhere. There are eight levels in total, all but two of which are side-scrolling fare. The other two, the “Base” levels, place the camera behind the player, only showing one room at a time. Once the room is cleared of enemies, it’s onto the next one and then the next after that, ultimately culminating with a boss fight. The boss fights are glorious as expected, with some really ugly mothers tossed in there. These are always some of my favorite moments in the Contra series, and they do not disappoint here. Destroying the alien heart in the final level is immensely satisfying. With that, I had 30 lives, and the gameplay experience became instantly more gratifying for a rusty gamer like myself. Although it felt a bit shameful to cheat like that, I was happy to make it past the second level and ultimately beat the game. Major props to Konami for realizing their game was hard as hell by throwing a bone for the rest of us. I would be remiss not to mention the existence of the greatest weapon ever created in gaming history: the spread gun. It remains the best, most rewarding gun I have ever come across, and using it is one of the action genre’s greatest thrills. The other weapons (i.e. the laser gun and cluster shot) are effective as well, but nothing compares to the almighty spreader. 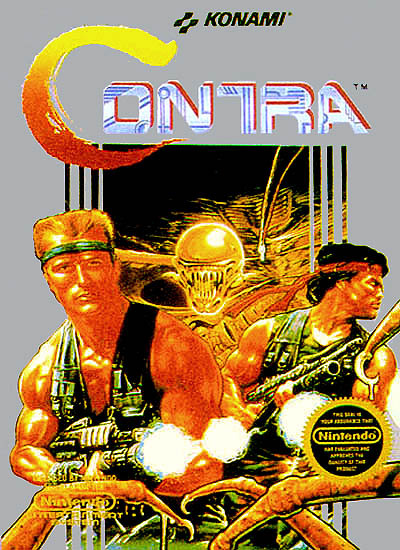 Contra still holds up remarkably well today, especially if played with a friend. The run-and-gun gameplay remains a blast (albeit an often infuriating one) on your own, but co-op is the way to go if you have that option. I’m glad that I was able to go back to this classic, even though Super C is still the better game for my money. I have flashbacks of spending weekends figuring out the cheat code and playing the game all the way through. It brought back a lot of memories for me, too. I loved playing Super C with my brother back in the old days. Think I’ll give Contra III a shot next. Using the Konami code while playing Contra is officially not cheating. Thus have I spoken. Haha, all right! Glad to hear I have your approval! Nice review! 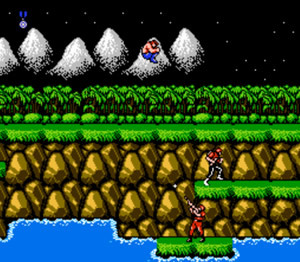 Contra is the only game I ever loved and never made it past the first level (never used the code). I tried and tried, and tried a thousand more times, but it never happened for me. Really need to try it again one day; it’s been many years. Yeah, it’s worth trying out again, especially if you’re willing to use the code. It makes a world of a difference in not having to worry about every hit pushing you closer to that dreaded “game over” screen. Ah, yes. Contra was one of my favorite NES games, and I agree that Super C is even better. What I like about Super C is that the code gets you 10 guys, and it’s still doable for the most part. 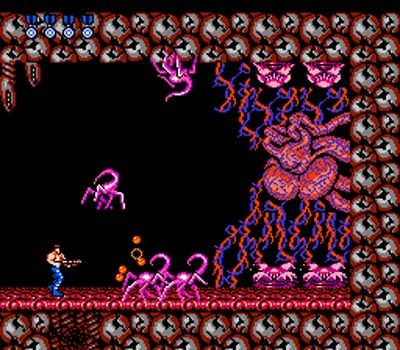 Contra has parts where it’s basically impossible not to get killed a few times, if not more. Still, I agree that it gets more fun because of that and you can just rush in there and blow everything away. Such a fun game. I still have Super C at home, but I may need to grab Contra at some point. 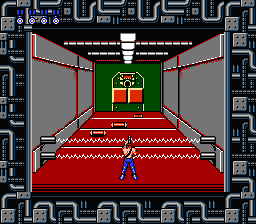 Yeah, there were a couple of painfully brutal levels in Contra. It blows my mind that there are people who can speedrun through the game, some even being able to do so without dying. I had to use a good 70 lives or so to make it through till the end, heh. I imagine it gets easier once you learn the patterns and whatnot, but it would take a lot of hard work to beat this with the bare minimum. Great to hear you are a fellow Contra fan, Dan! i grabbed this for the xbox 360 when it was on sale. However it is the arcade version which is different from the NES version ;-( Happily the konami code works because without it this game is damn hard. I did the same thing, man. I never got past the first level in the arcade version. The analog stick does not work nearly as well as the arcade stick — it seems to make everything even more difficult. This game is so tough but so good! Serious props to anyone who can beat this without the Konami code, I don’t even want to try. I do like your comparison to sci-fi/action movies of the eighties. That seems so apparent but i’m not sure I’ve ever made a mental connection between the two, it’s gotta be all those movies you watch, haha! Haha, you’re probably right about that! These guys definitely have an Arnold/Stallone vibe to ’em. And I’m with you on beating the game — I can’t imagine finishing it without the Konami code. Hehe, this sure is a cruel game regarding difficulty, but that was quite common back in the 8-bit era and I kind of miss it. Back then you never knew if you would beat a game, actually ever beating it. Now when you buy a game you are sure there are difficulty levels that you can lower and more important, save points, excess of health-packs and even regeneration is standard now… I am hoping that the success of Demon’s Souls and Dark Souls will trigger more developers to make more difficult games. But, perhaps the publishers don’t like that too much, since then they cannot sell so many games, if you are stuck with the same one for a year haha!! Haha thanks man! I’m going to try to write about retro games more often — gotta keep this project going! Oh, you just struck a chord with me like you couldn’t imagine. I am about to date myself but I remember first buying Contra when it came out. I was so excited for my mom and dad to get me home so my brother and I could play it. We thought it was the greatest thing we’ve ever seen. The two player co-op is what really made it our favorite. I can’t tell you the hours and hours we spent playing together. And the music. I can still remember the music in my head just like I was listening to it now. Great review!!! !